When it comes to resources for the defense and aerospace industry, Currituck provides nothing but opportunity, including available real estate and a capable workforce. Norfolk Naval Base, NASA Langley Research Center, the Port of Virginia, and Hampton Roads are all close enough to provide businesses with opportunities for partnerships and contracts. The Currituck County Airport has partnered with College of The Albemarle to offer an Aviation Maintenance Technology course, preparing students for FAA Part 147 certification. This has provided hands-on training to prepare students for the aerospace industry. Classes take place within a new 40,000 square foot training and workforce development-oriented facility built by Currituck County to house College of The Albemarle’s Aviation Technology, Machining and Graphic Design programs. College of The Albemarle & Currituck County was awarded the North Carolina Community College System prestigious Distinguished Partners in Excellence Award for its partnership with the Currituck County Airport. Defense and government contracts provide opportunities for existing businesses and entrepreneurs to broker deals and establish relationships for lasting business. Veterans, families of veterans, and Currituck locals are just some of the laborshed makeup that Currituck has to offer. In fact, there are over 100,000 active-duty and reserve personnel and more than 40,000 civilian employees of the military in our region. With this strong military presence in the area, employers can draw from job applicants who have training in many different technical fields and who have opted to stay in our region. Often defense and aerospace industry businesses need a large amount of space for buildings, test facilities, etc. 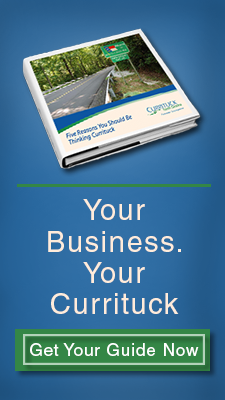 Currituck can offer new and relocating businesses a wide variety of current buildings, land and area developments to consider. Having strong, diverse airports and aviation infrastructure, especially those with available land and capable facilities, is critical to aerospace industry. In Currituck the aviation-related businesses will find a wide range of airport facilities to meet their needs. The Currituck Regional Airport, owned and operated by Currituck County, is a Corporate & General Aviation airport that is open to the public, located approximately 40 miles south of the Norfolk, Virginia and 20 miles northeast of Elizabeth City, North Carolina. Currituck Regional Airport offers aerospace companies a location with built-in value. It has affordable development sites with direct tarmac access and on-site training at the adjacent College of the Albemarle Regional Aviation & Technical Training Center. All of this adds up to a win-win for defense and aerospace industry. You'll be in good company in Currituck County. These are just a few of the corporate and federal defense and aerospace facilities we have in our strategic and innovative mid-Atlantic region. 1. Academi – Currituck County, N.C.
2. DRS Technologies – Elizabeth City, N.C.
3. TCOM - Elizabeth City, N.C.
4. Telephonics Corp. – Elizabeth City, N.C.
5. Alcoa Howmet – Hampton, Va.
6 a,b. Lockheed Martin – Chesapeake and Suffolk, Va.
7 a,b,c,d. Raytheon Technical Services Company – Chesapeake, Virginia Beach, Norfolk and Suffolk, Va.
A. U. S. Coast Guard Air Station Elizabeth City – Elizabeth City, N.C.
C. Naval Station Norfolk – Norfolk, Va.
D. Joint Base Langley-Eustis – Hampton and Newport News, Va.
E. NASA Langley Research Center – Hampton, Va.
F. NASA Wallops Flight Facility – Wallops Island, Va.
G. Marine Corps Air Station Cherry Point – Cherry Point, N.C.